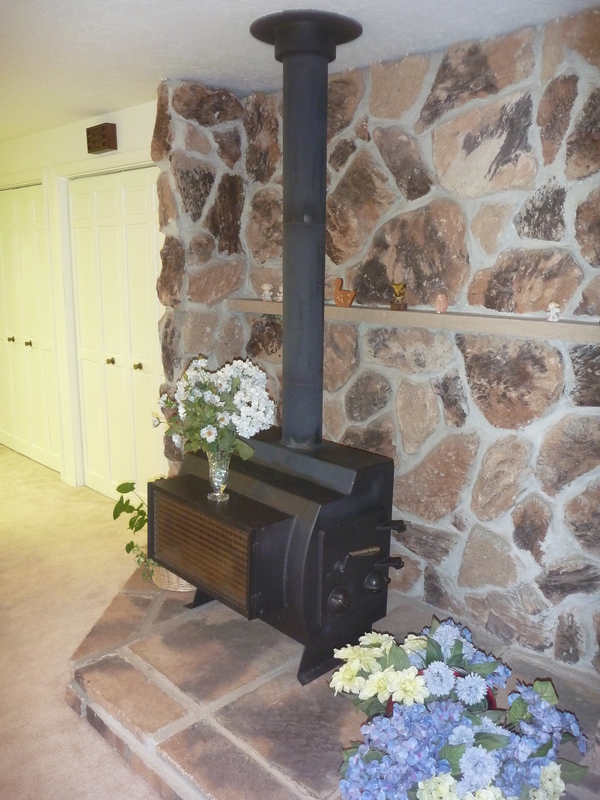 Starting August first 2010, your trusty old wood stove will need to be destroyed! Under the guise of environmental protection the Oregon State Department of Environmental Quality has decided that wood stoves built before 1985 must be removed if the home is part of a real estate transaction. To be fair, wood stoves that are 25 years old or older are not as efficient as modern units and much of the heat that is produced is exhausted up the chimney. Unfortunately, these regulations hit at a time when short sales and foreclosures abound and if a seller did have some wiggle room it may now be soaked up with the cost of the removal of the old wood stove. There can be many different ways to come to a good looking finished product. Skimping here or there can be ok depending on what you are dealing with. From what I look at day in and day out, if you are installing anything outside it should be the best you can afford and maybe a little better. I am not talking about the finishes. People tend to get caught up on what they can see and understand, which makes sense. But the parts that hold up those wonderful jungle hardwoods or space age composites are the things that are really important. The first thing that jumped out was the outside structural beams, or lack there of. support all the way to the edge or if they got the wrong beam in the first place and again decided to ‘make it work’ instead of getting the proper sized beams. Either way this set up is really a classic example of how not to build a deck. everyone on the same page at the very start of the inspection. liability for my actions and recommendations. highest quality home inspection every time. home to a perfect home, and there is no such thing. how you can prevent it in the future. even the best inspection report. Thanks for the pictures Melina. A fantastic local agent, my friend and web guru Melina w/ Tomson Burnham LLC had a great idea for a series titled: What to Expect when you’re Inspecting. Cute and clever and she said she would let me use it. I figured I would start from the beginning of the home inspection process and go through it step by step. So first things first: you just received notice of an accepted offer and you have a certain amount of time to get all of the applicable inspections and make negotiations. If you are working with a good agent they will give you some names of home inspectors that they know do a good job. Check these guys/ladies out. Check their website, read their blog, and give them a call. Learn about their experiences and what makes them better than the other inspectors. Talk to them about your new home. Find out how they communicate. I wish I would have done this when I bought my first home. The guy I hired to do my home inspection gave me a lot of grumbles and, what I now call the “home inspector shrugs.” A home inspection is not like a loan. With a loan, the numbers are what you need to focus on. Everyone plays with the same numbers. A home inspection is a very personal thing and for the same number (price) home inspections can range from a gobbledy gook mess of check boxes and confusion to a clear concise description of the repair and maintenance issues with your new home and can actually be future user’s manual. Beside the report, how is the inspector at educating you. If the inspector grunts, shrugs a lot but you saved $50….maybe that isn’t the best place to save a couple bucks. Once you have found your favorite inspector and you have confirmation on your deal you should get on the internet and book yourself an inspection. Most of the time buyers negotiate a 10 business day window however if you find yourself dealing with the bank you might only get 5 calendar days to get your inspections. If you are hoping for a really great inspector during the summer months and you only have 5 days…….good luck. 10 business days gives you two calendar weeks and should be enough to get your all of your inspections done but you need to start immediately if not before your offer is accepted. I have been at least a calendar week out since April and I have had to do my share of referrals to other good, but not as good, home inspectors in the Salem Oregon area. So you need to make a choice, really good in-demand inspector or mister inspector guy that can fit me in tomorrow. It is up to you and who knows, that short notice guy might just do a good job for you. Oil tanks were very common between the 1920s and 1960s to store the relatively cheap heating oil for the oil furnace. If the home has exchanged hands a few times the underground tank may not be known about. The presence of oil tanks is an issue that can rear its ugly head on an inspection every now and then. Thankfully the Oregon DEQ is doing something to help. The Department of Environmental Quality (DEQ) here in Oregon, has a program to help keep track of those oil tanks that may have been forgotten. If excavation or redevelopment is planned you can find information on known and suspected Heating Oil Tanks (HOT). Information on: if the site has received a closure letter for the decommissioning, assessment and certification of a HOT is available. If a HOT is present there may be contamination of the surrounding area and a cleanup may be required. Decommissioning, assessment, and cleanup must be performed by a DEQ licensed HOT Service Provider. For you agents out there check out this publication: What agents should know about underground oil tanks. These carpenters just don’t care what you want and they are just going to make themselves at home. They are just one of the three big players in the wood destroying insect world around Salem, Oregon . Or the pest part of a “Pest and Dry rot” Inspection. Overall carpenter ants are relatively easy to control but this control does require some environmental adjustment and future vigilance. 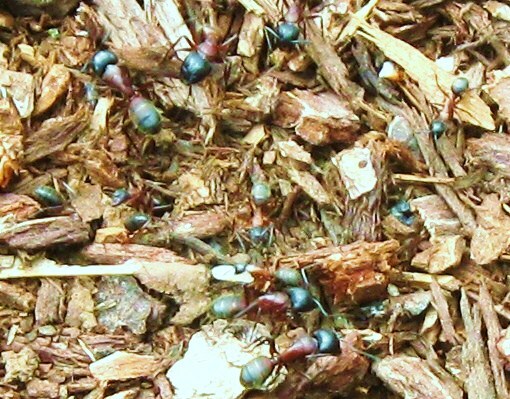 One of the most common conditions that cause ant activity is Bark dust/mulch. Bark dust is used in this area as a mulch to beautify flower beds, limit rain splash and stifle weed growth. Another thing that a thick layer of this stuff does is it provides a very favorable home to carpenter ants. The large bulk piles the suppliers have are usually filed with ant nests and when your neighbor gets a large pile delivered you had better watch out! The nest that was harmless in the bulk pile is relocated and now these ants start looking for a better home. Depending on your home’s condition it might provide the perfect areas for the ants to move-in. Another often overlooked area for carpenter ant activity and nest making is wood retaining walls. Yes even the treated wood can be a great place for these critters to call home. The reason poisonous treated wood is a good home for carpenter ants is because they do not actually eat the wood. Unlike termites and anobiid beetles carpenter ants just hollow out the wood to make nests. The ants eat insects and other little woodland creatures but not wood, so the poison does not effect their ability to make a nest. Plants up against the home are probably the next big issue that contribute to ant activity. The plants seem to keep the home more humid and may damage the siding allowing easier access. Also if you are applying a perimeter treatment the ants can gain elevation on the plants and enter your home without touching the poison. Any way you look at it plants in contact with your home, wood retaining walls and thick bark dust are all bad news and any of the many types of carpenter ants we have around the Salem, Oregon area would love to make themselves at home in yours. Roofing is one of the few skilled professions where being a licensed contractor is not required if you do it on your own home here in Salem Oregon. Hiring a licensed contractor is definitely encouraged, however a home owner with a little DIY initiative can tackle the job on their own with no distractions (like code enforcement inspections) from the city building department. A roof shingle system is one of the few things on a home that will wear out. Unlike siding that can be painted and painted and preserved for eons, there is nothing to do about your roof shingles wearing out. There are things to do to extend the roof’s life. Adding ventilation, keeping debris off, treating moss and having a very steep roof will all prolong the life of the roof however even the best ventilated, cleanest, and steepest roof will generally only increase the life of the shingles by 20 years max. One way or another most homeowners will face a roof replacement at some time. Just like most trades you do not have to be a Harvard graduate to install a roofing system. The steps are, overall, very straight forward and logical. The problems most unskilled craftsmen face will be at tricky transitional zones: flashings, valleys, roof-to-wall and the dreaded skylight. It must be a testosterone thing but from what I have seen as a home inspector if problems are encountered they are handled one of two ways: Gallons of roofing tar, or scab-it-in and forget-about-it. I guess maybe I have seen some roofs that have been replaced by home owners who knew enough to know that they needed some advice. That is what the internet is for as far as I am concerned. Those roofs maybe just flew under my radar mostly because they were done properly. So thank you very much to those homeowners who stopped and asked.